A memorandum of agreement (MoA) was signed between CSIR-SERC and M/s Consortium Transmission Systems Pvt. Ltd., Hyderabad, on 30 April 2015, for transfer of technology on Analysis, Designing and Structural Detailing of G+3 and G+1 Reinforced Concrete Building using EPS. A memorandum of agreement (MoA) was signed between CSIR-SERC and National Research Development Corporation (NRDC), New Delhi, on 6 January 2017, for marketing the inventions/innovations, patents, formulations, know-how/ processes developed by CSIR-SERC. The MoA was signed by Prof. Santosh Kapuria, Director, CSIR-SERC, and Dr. H. Purushotham, Chairman & Managing Director, NRDC. A memorandum of understanding (MoU) and agreement was signed with Research Designs & Standards Organisation (RDSO), Lucknow, for evaluation and management of longitudinal force on substructure of railway bridges. The MoU and agreement was signed between Prof. Santosh Kapuria, Director, CSIR-SERC, Chennai, and the Director (B&S)/SB-I, RDSO, Lucknow, on 20 March 2017 at Lucknow. A memorandum of understanding (MoU) was signed with National Thermal Power Corporation (NTPC), New Delhi for the condition assessment of RCC/ steel structures in NTPC power stations spread across the country, and provide recommendations for suitable repair and remedial measures to ensure the structural integrity and restoration of life and health of affected structures. The MoU was signed on 4 April 2017, by Prof. Santosh Kapuria, Director, CSIR-SERC and Shri Susanta Kumar Roy, Executive Director (OS), NTPC, Noida. A memorandum of agreement (MoA) was signed between CSIR-SERC and M/s. Level9 Biz Pvt. Ltd., Mohali, on 18 May 2017, for transfer of technology on Pre-fabricated EPS – Lightweight reinforced concrete building technology. A memorandum of agreement (MoA) was signed between CSIR-SERC and M/s. Smart Built Prefab Pvt. Ltd., Hyderabad, on 10 June 2017 (during the CSIR-SERC foundation day celebrations), for technology transfer for manufacturing textile reinforced concrete panels for the construction of rapid built, affordable, light weight and durable toilets. A memorandum of understanding (MoU) was signed between CSIR-SERC and Durgapur Steel Plant (DSP) of Steel Authority of India Ltd. (SAIL), a PSU Maharatna under Ministry of Steel, Govt. of India, on 22 June 2017, for condition assessment of concrete and steel structures of different shops and installations in SAIL-DSP situated at Durgapur. MoA was signed between CSIR-SERC and M/s. Lakshmi Srinivas Engineers, Hyderabad, on 07 August 2017, for transfer of technology on Technology for Construction of Toilet Unit with Precast Thin Segmental Elements. 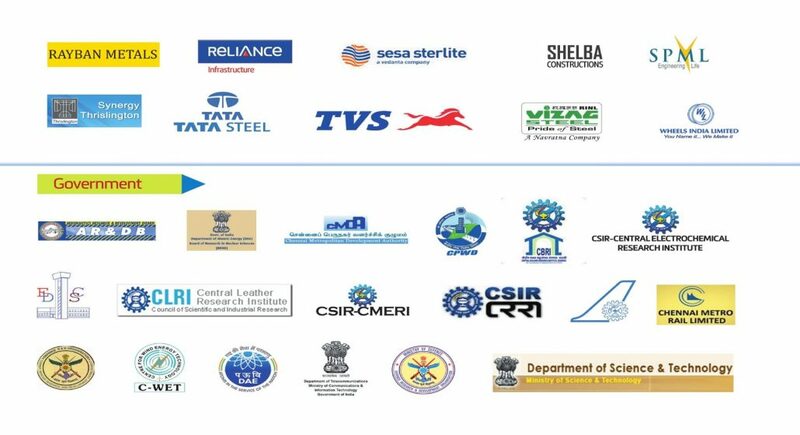 MoA was signed between CSIR-SERC and M/s. Lakshmi Srinivas Engineers, Hyderabad, on 07 August 2017, for transfer of technology on Technology for Construction of Water Tank Using Flow-able Cement Mortar. A tripartite agreement was signed between CSIR-SERC, NRDC and M/s. Fractal Enterprise, Vishakhapatnam, on 26 February 2018, for transfer of Technology for Construction of Toilet Unit with Precast Thin Segmental Elements. A tripartite agreement was signed between CSIR-SERC, NRDC and M/s. Natural Waste Management Technologies Pvt. Ltd., Krishna (dt. ), A.P. on 26 February 2018, for transfer of Technology for Construction of Toilet Unit with Precast Thin Segmental Elements. MoU was signed between CSIR-SERC and lndian lnstitute of Technology Guwahati (llTG) on 17th April 2018 for “Intellectual cooperation scholarly exchange, and the development of national partnership”. A tripartite agreement was signed between CSIR-SERC, NRDC and M/s Kiran Global Geocements Limited, Chennai, on 10 June 2018, for transfer of Technology for Geopolymer Blocks. MoU was signed between CSIR-SERC and Bhabha Atomic Research Centre (BARC), Mumbai on 10th June 2018 for “Fatigue crack growth studies on full scale dissimilar metal pipe welds”. MoU was signed between CSIR-SERC and lndian lnstitute of Technology Tirupati on 5th July 2018 for “Intellectual cooperation scholarly exchange, and the development of national partnership”. MoU was signed between CSIR-SERC and lndian lnstitute of Technology Madras (llTM) on 27th September 2018 for “Intellectual cooperation scholarly exchange, and the development of national partnership”.